Lucky for me, Erica at Personal Scrapper started a mini online crop last night. I think the boys are tired of spending time with me...and with each other. We were able to spend time together in the same room today as I scrapped a bit and they took turns between playing on the computer and PS2. 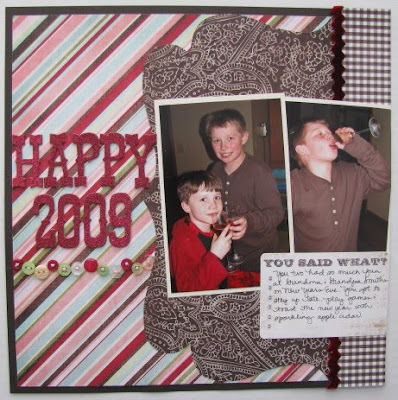 The first challenge I completed was to scraplift a LO Erica posted using the February PS kit. 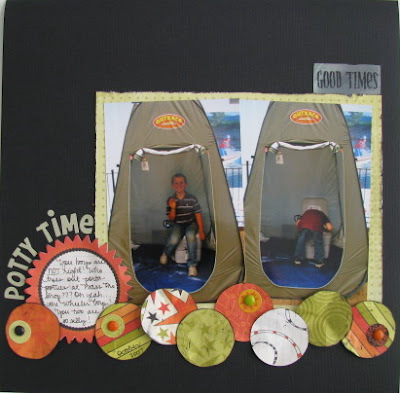 I pulled out these two photos of the boys playing inside a portable toilet at Bass Pro Shop a few years back. It was NEW one on display. We were on our way back from the pumpkin patch, so I had my camera with me. I used the Halloween themed "Salem" line by Scenic Route even though they aren't Halloween photos - the papers just really matched well. For the celebration LO, I scrapped New Year's 2009. I am really proud of myself for working in pink with these photos! There is also a photo collage (4 or more photos) challenge. 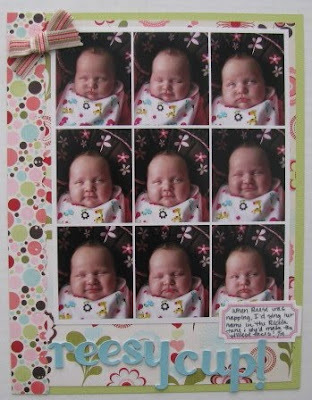 I've had this collage of Reese (my niece) printed out for a couple months now. Finally, I have an excuse to scrap it! Since the photo collage was so large, I kept everything else really simple. You are probably wondering about the story behind "reesy cup!" Well...I was watching her one afternoon and while she was asleep, I'd sing "Reesy Cup..." to her to the tune of "Ricola!" (as seen on the commercials). Every time I'd do it, she'd smile or make a funny face. Her eyes would open, but you could only see the whites. I'm so glad I had my camera nearby! There are seven more challenges that I "hope" to get to before the crop is over. Those layout are sooooo darn cute! You never cease to amaze me! Great work! 9 layouts = 1 great value!